It’s not really that hard to come up with a big list of keywords you want to rank for. 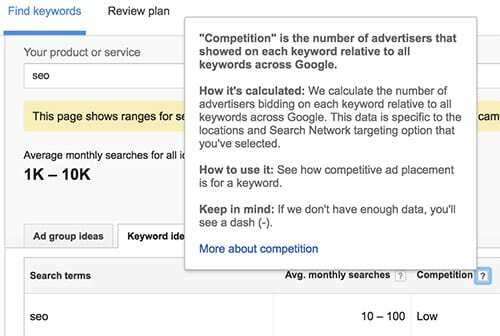 The hard part is figuring out what it takes to rank #1 for each keyword and use that information to prioritise your list and plan your SEO strategy. 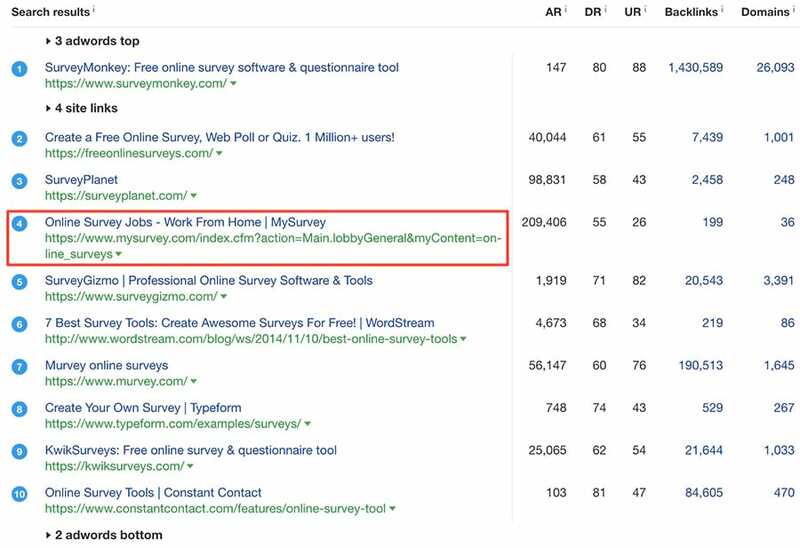 Many keyword tools (Ahrefs included) try to solve that problem by showing you a “keyword difficulty” or “keyword competitiveness” metric – but can you rely on their judgement? Well, the goal of this article is to give you the definitive answer to this question. Basically, the entire SEO industry is nothing but hundreds of thousands of people using trial and error to figure out how Google ranks pages. In a nutshell, all we know today is that Google uses over 200 different ranking factors, with the 3 most important being Links, Content and RankBrain (not necessarily in that order). If you want to determine keyword difficulty with 100% accuracy, you need to use exactly the same algorithms that Google uses to rank pages. So does any third‐party tool have access to Google’s ranking algorithms? Could they develop information‐processing algorithms that could boast the same level of sophistication as Google? That’s why no keyword difficulty checker is perfect and each tool can only give you their best estimate. Ideally, you’d want to vet these pages for all of Google’s 200+ ranking factors. But since no one (except Google) really knows how much each individual factor contributes to the resulting ranking of a page, it makes sense to focus on the biggest ones: links and content. 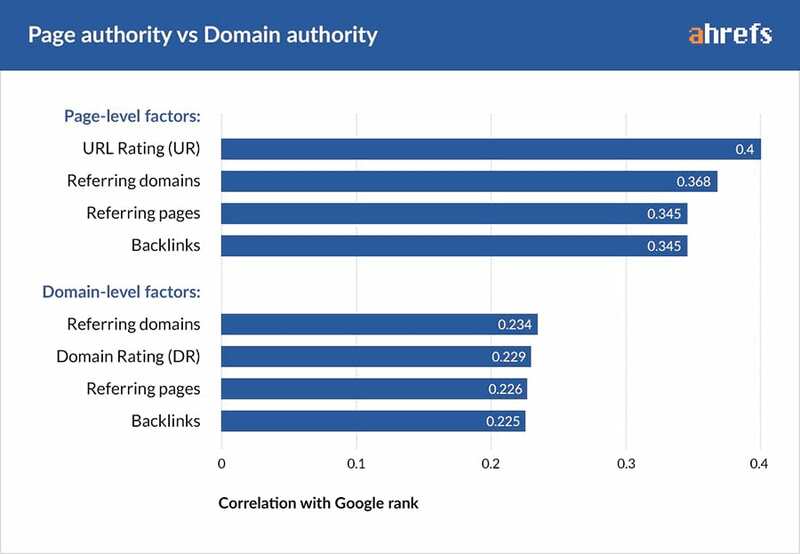 One other interesting takeaway from the above graph is that the number of referring domains to a page has a better correlation with Google rankings than just a raw number of backlinks. So, as a general rule, it’s better to get one link from 10 different websites than 10 links from a single website. 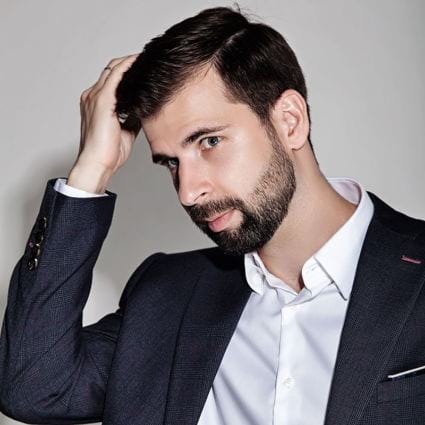 But apart from the sheer quantity, there’s also a quality factor in place: a small number of high‐quality links may trump a larger number of lower quality ones. And yet, even with UR (which is the highest correlated metric in the SEO industry) we’re only scratching the surface of how Google would process backlink factors. Where is the link located on the page? At what pace is the page acquiring new backlinks? A lot of SEOs believe that the so‐called “domain authority” (or “domain rating”) has a big influence on a page’s ability to rank. As you can tell from our data above, domain‐level factors have significantly smaller correlation with rankings than page‐level factors. And yet that correlation is still quite solid. I’m afraid we can’t confirm that based only on this correlation. Correlation ≠ causation. But what our data suggests is that you should be able outrank high‐DR websites if you have more links coming to your page. Usually SEOs won’t go too deep in reviewing a given SERP: they will just look at the number of linking domains and UR/DR of the top‐ranking pages and settle with that information. But for some important keywords you may want to go as far as reviewing the actual backlinks, where they come from and what would it take to replicate them. Looks like the pages with only 6–20 referring domains are outranking the pages with 900‑1000 referring domains. This is a perfect illustration of how relevant content can outrank even the strongest backlink profile. 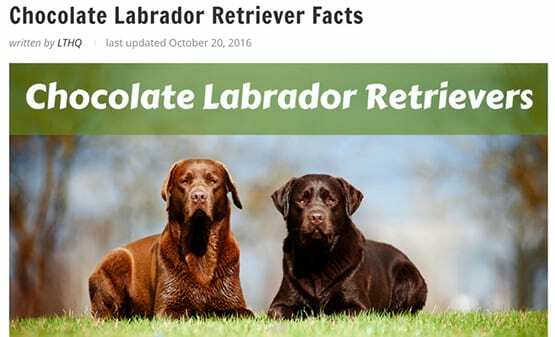 What we see in this example is called “lack of relevant content.” The top‐ranking results are targeting a broader search query (Labrador retriever), rather than a very specific one that people are searching for (chocolate lab). That is a massive opportunity for relevant content to shine, and that’s how those two articles got to the top without a lot of backlinks. Usually what you get in the SERP is “slightly imperfect content” (at best). The top‐ranking results are 100% relevant to a search query, but they could do a slightly better job of giving visitors what they’re looking for. This kind of SERP won’t give you the same level of competitive advantage as “lack of relevant content,” where you can rank without backlinks. So how do you know if the search results for your keyword are lacking relevant content, giving you a good chance to beat them without links? Imagine you put your target keyword in Google and see that the top‐ranking pages don’t use that keyword in their Title/URL/Headline. This indicates that you can easily outrank them if you just use the keyword in your page’s Title/URL/Headline, right? The best practices of on‐page SEO in 2017 are not as straightforward as they were back in 2010. 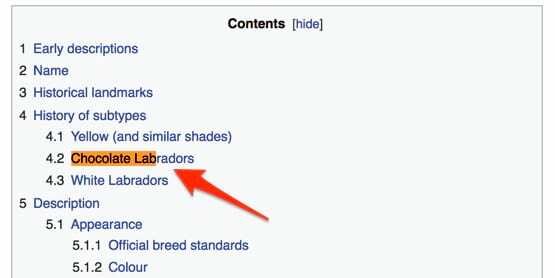 Back then, Google didn’t have fancy things like Hummingbird and RankBrain, so it needed some very strong clues to understand what your page was about. 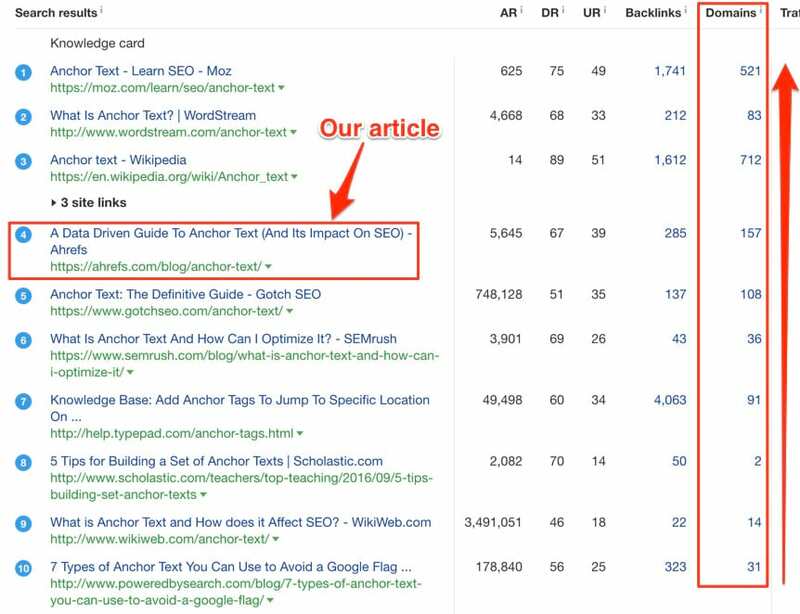 Putting your exact‐match keyword in the Title/URL/Headline of your page gave a strong competitive edge over the pages that weren’t doing that. But this trick doesn’t work anymore. Today, Google is smart enough to understand what your page is about even when a target keyword is never mentioned on the page. In fact, by studying 2 Million keyword searches we have discovered that almost 75% of the pages that rank in Google’s Top10 don’t have a single mention of an exact‐match keyword in their content. Clearly, Google understands that things like “guest writing,” “guest blogging” and “guest posting” are closely related. 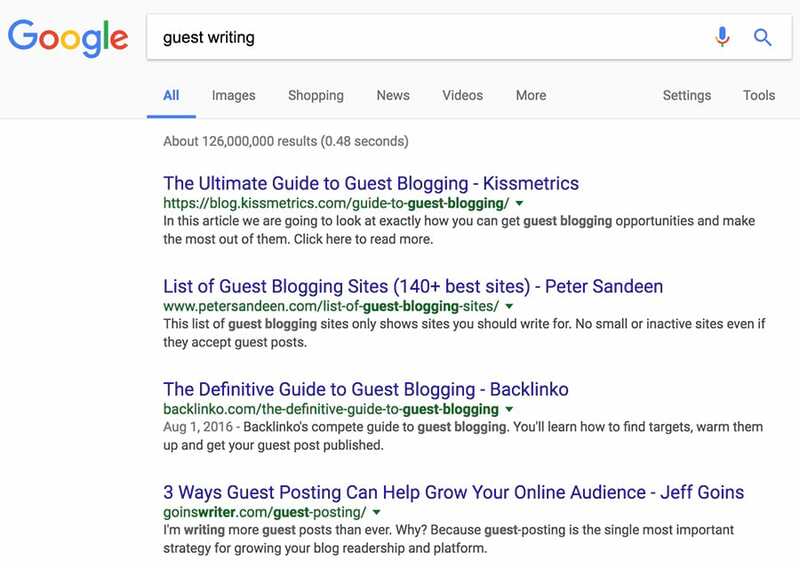 So if you perfectly optimize your page for the keyword “guest writing” in accordance with these old‐school on‐page SEO best practices, that won’t give you any competitive edge at all. 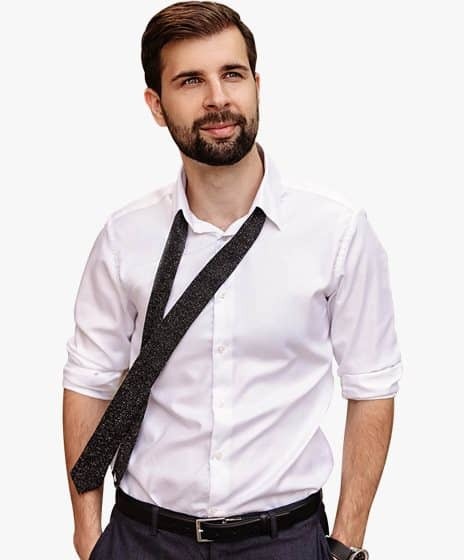 Or should I re‐phrase that as “how to make your page MORE relevant than the pages that currently rank in the Top10, so Google will rank your page higher even with fewer backlinks”? Well, I’m afraid there’s no easy and straightforward way to do it. Sounds complicated, right? That’s because it is. You can try studying things like latent semantic indexing (LSI), latent Dirichlet allocation (LDA) and other topic modeling algorithms, but most people obviously won’t go that deep. Since Google is getting so smart that it almost “reads” the pages of your website, why should you even bother adjusting your pages to meet some complex criteria of its algorithms and not just “write for humans”? Well, the important word here is “almost.” Despite its impressive complexity, Google is still a machine, and if you understand how it works and can adjust your pages accordingly, you’ll be one step ahead of everyone else. 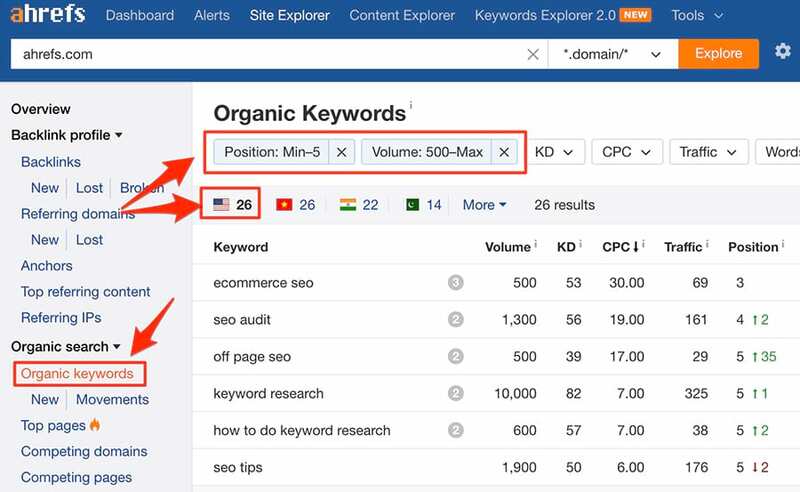 Use Ahrefs’ Site Explorer tool to analyse top‐ranking pages for your target keyword and see what other keywords they also rank for. This will give you some clues as to what topics Google thinks they’re relevant to. Open the Top10 pages that rank for your target keyword and use one very sophisticated tool to extract topics from them – your brain. If you Google around and study all the pages related to your topic, you’ll naturally build a good thesaurus of words and topics that will help Google identify your own page as perfectly relevant. In most cases “relevance” and “user intent” go hand in hand. But sometimes a perfectly relevant search result might not give the user what he’s looking for. But what happens when we search for exactly the same keyword from the United Kingdom? And Google has somehow identified that most people in the US are looking for an online survey tool, while a lot of people in the UK are also interested in making some money by participating in online surveys. whether people get what they were looking for from their first search or if they will keep refining it and clicking on more search results. And these kinds of things can sometimes outweigh the topical relevancy of a page. 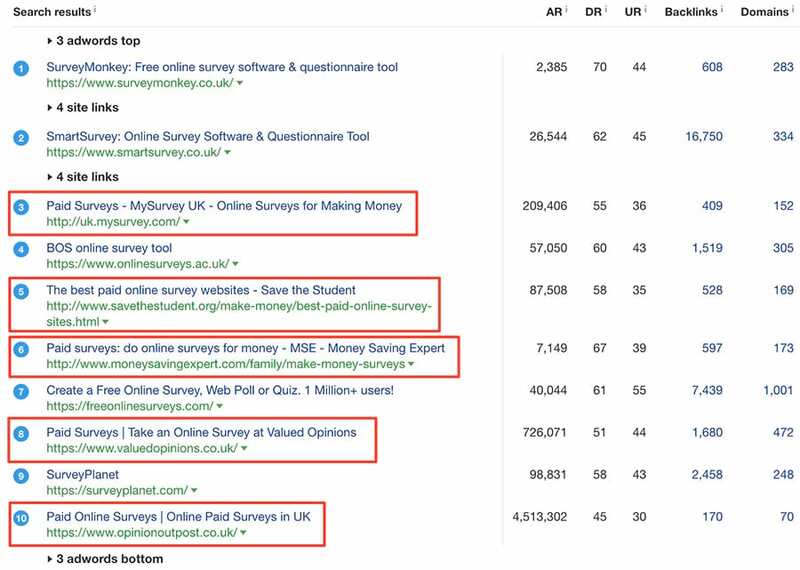 I mean, if more people in the UK started clicking on search results related to “online survey jobs,” Google would see that and drop a bunch of “online survey tools” results from the front page – even if they were perfectly relevant to the keyword “online survey” and had tons of backlinks. A good way to learn whether Google is happy with the search results or if it’s still figuring out what’s best for users is to look at the SERP history. The same 5 pages have been ranking at the top for quite a while, with only small shifts in their positions. The pages have jumped on and off the Top10 for almost a year. And only recently, Google seems to have figured what kind of search results satisfy people the most. In other words, SERP position history can be somewhat indicative of Google’s own level of satisfaction with their search results and thus reflect your chances of squeezing your own page onto the Top10. And that winds up our discussion of the factors you should review when assessing a keyword’s difficulty. Now let’s discuss Ahrefs’ Keyword Difficulty metric and how it can make things easier for you. But that doesn’t really help you understand what KD 15 or KD 65 means, right? 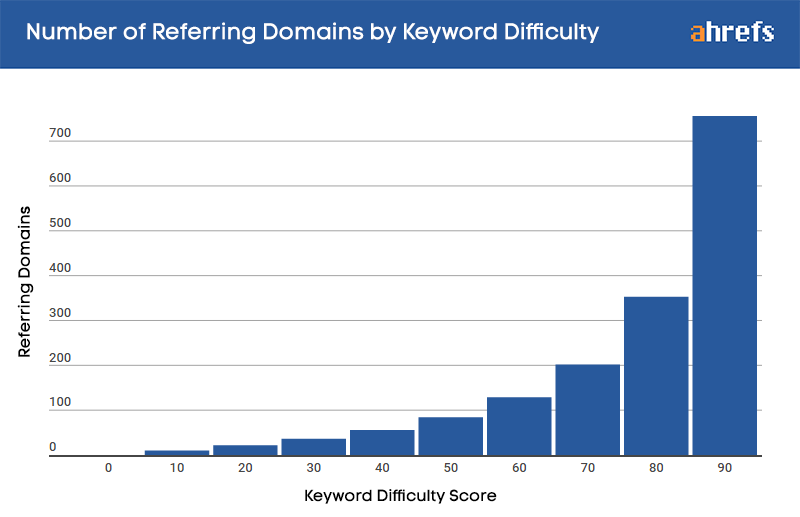 Our keyword difficulty metric gives you an estimate of how hard it would be to rank in the Top10 search results for a given keyword. This little nuance causes a lot of confusion: People see an insanely strong page ranking #1 and decide that our KD score is not accurate. But if you look at pages #2–10, they may be a lot weaker and thus easier to outrank. Here at Ahrefs, we believe Google relies heavily on backlinks to identify the pages that deserve to rank in the Top10. And let’s not forget about those sophisticated topic modeling algorithms that I mentioned earlier. In other words, creating a keyword difficulty score that accurately predicts the #1 is as easy as building our own Google here at Ahrefs. That’s why for now we’ve settled with predicting the chances of ranking in the Top10, which we do quite accurately. We look at how many referring domains (RDs) the Top10 ranking pages for a given keyword have. We don’t take into account things like: domain rating, the age of the website, usage of the keyword in the Title/URL/H1, etc (I’ll explain why below). We also don’t differentiate between dofollow and nofollow links, because the SEO community still has not decided if nofollow backlinks help you rank or not. 3. Why don’t you take into account any “on‐page SEO” factors? First of all, let’s define the “on‐page SEO factors” we’re talking about. Well, numerous studies (ours included) have confirmed that these kinds of things have a minuscule correlation with rankings compared to backlink factors. So even if we were to include them in our KD calculation, they would change the resulting KD score by no more than +/‐ 3 points. That’s not significant enough to bother spending CPU resources on it. But if we’re talking about the advanced on‐page SEO concepts I’ve mentioned above – topic modeling, TF‐IDF, entity salience, etc. – we’re obviously working in this direction. We’re just not ready yet to apply what we have to our KD formula. To the best of my knowledge, there’s no keyword difficulty tool on the market today that would process the “advanced on‐page SEO factors.” Most of them just take into account such basic things as “keyword in title,” which worked 5 years ago but makes zero sense today. Given that Ahrefs boasts the world’s best database of live backlinks, our Keyword Difficulty score represents the most accurate picture of how competitive a SERP is backlink‐wise. But even though Ahrefs is more accurate than any other tool, we don’t recommend that you blindly base your SEO decisions on our KD score alone. It can be a great “first filter” to weed out the keywords that would require way too many backlinks to rank, but then you’ll have to look at the actual SERP and vet the top‐ranking pages manually in the way I explained above. 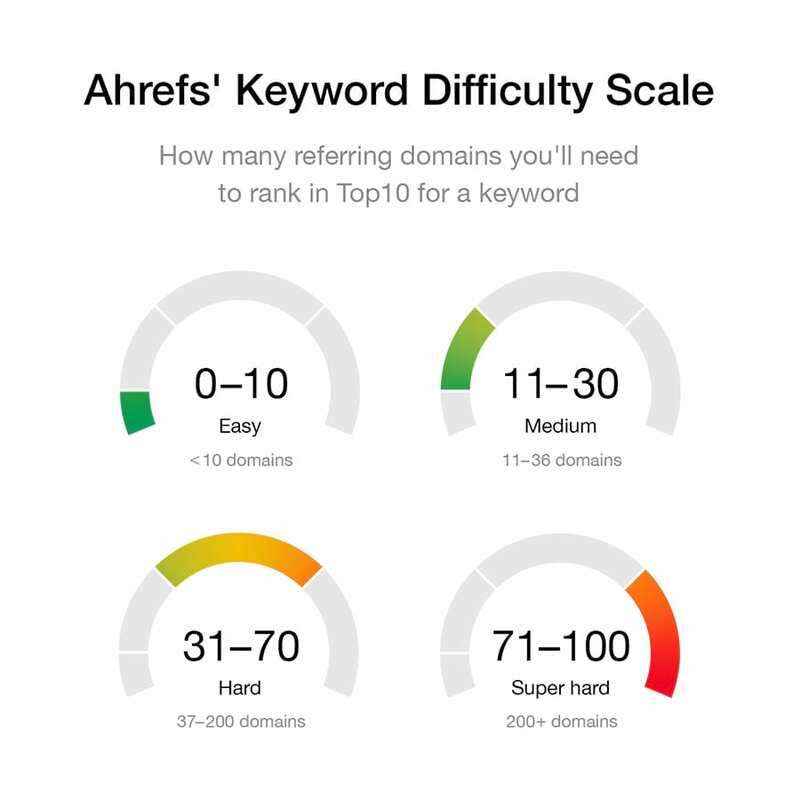 Because Ahrefs’ Keyword Difficulty metric is tied to the number of referring domains and nothing else, the scale is pretty straightforward. This question is tricky, because what seems to be “easy” for one person might turn out to be “insanely hard” for someone else. Even for us at Ahrefs, getting ~40 websites to link to our page is pretty hard to do. 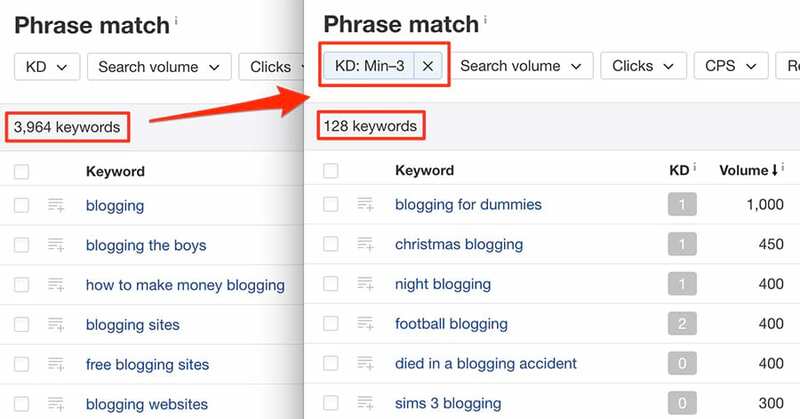 You can easily identify your “safe” KD range by looking at the keywords you currently rank for. As you can see from the “Difficulty distribution” graph, most of the keywords in my list fall into the KD 40–60 bucket. 8. Why are a lot of KDs in my report gray? Fresh — once you click the “Get metrics” button next to any keyword, we’ll get the fresh SERP and calculate a KD based on the pages that rank there at this very moment. The resulting number will be assigned a color in accordance with our scale above.